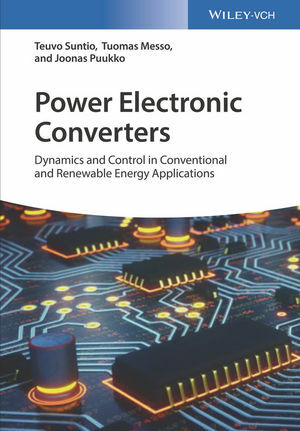 Filling the need for a reference that explains the behavior of power electronic converters, this book provides information currently unavailable in similar texts on power electronics. Clearly organized into four parts, the first treats the dynamics and control of conventional converters, while the second part covers the dynamics and control of DC-DC converters in renewable energy applications, including an introduction to the sources as well as the design of current-fed converters applying duality-transformation methods. The third part treats the dynamics and control of three-phase rectifiers in voltage-sourced applications, and the final part looks at the dynamics and control of three-phase inverters in renewable-energy applications. With its future-oriented perspective and advanced, first-hand knowledge, this is a prime resource for researchers and practicing engineers needing a ready reference on the design and control of power electronic converters. Teuvo Suntio is Professor in Power Electronics at Tampere University of Technology, Finland. He has been also Adjunct Professor in Control Engineering at the Aalto University (TKK) in 2001-2011, and in Power Electronics at the University of Oulu since 2004. He has also served 20 years in power electronics industry as a design engineer and an R&D manager prior to starting the academic career in 1998. He has authored or co-authored over 200 international conference and journal articles, supervised close to 100 MSc students as well as 18 PhD students during the nineteen years in academy. Tuomas Messo is Assistant Professor in Power Electronics at Tampere University of Technology, Finland. His current research aims to identify the source of harmonic resonance problems reported in grid-connected power electronic systems through dynamic modeling and mitigating the problems by shaping the inverter impedance. His teaching activities include basic power electronic courses and advanced courses, which concentrate on DC-DC converter design and dynamic analysis of three-phase DC-AC converters. Joonas Puukko is with ABB Oy High Power Drives in Helsinki, Finland. Previously he was with ABB Oy Solar Inverters and ABB Inc. United States Corporate Research. He obtained his PhD from Tampere University of Technology, Finland, for a work on dynamics of grid-connected three-phase converters. He has expertise in hardware and control system design in various power electronics applications ranging from few tens of watts to hundreds of kilowatts.